Boaties from around the country flocked to the Auckland suburb of Mt Wellington for the 2017 Rayglass Boats’ Open Weekend and Factory Tour on September 8-10. The crowds enjoyed a behind-the-scenes glimpse into the high quality production processes at New Zealand’s most successful luxury GRP pleasure boat manufacturer. “They really enjoyed being able to see our Rayglass boats in various stages of construction and loved being able to meet and talk with the team responsible for building and finishing the boats to such a high standard,” says Rayglass sales director Scott Little. 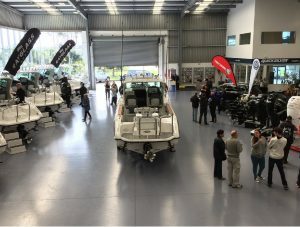 Scott says those attending relished the opportunity to see all of Rayglass’s multi-award winning Legend range of trailer boats in one place, along with the popular new 3500 cruiser and a selection of the company’s internationally-renowned Protector RIBs. Scott says many of those who visited over the weekend took the opportunity to “cut a deal” and secure their new Rayglass boat for the summer. “We were also pleased to raise significant funds for Coastguard via a sausage sizzle and everyone enjoyed the fresh coffee.